OEM spec capacitor for E.M.G motors. Flying lead with ring crimps specifically for the terminal blocks in E.M.G motors. The following table shows what capacitor can be found in which motor. 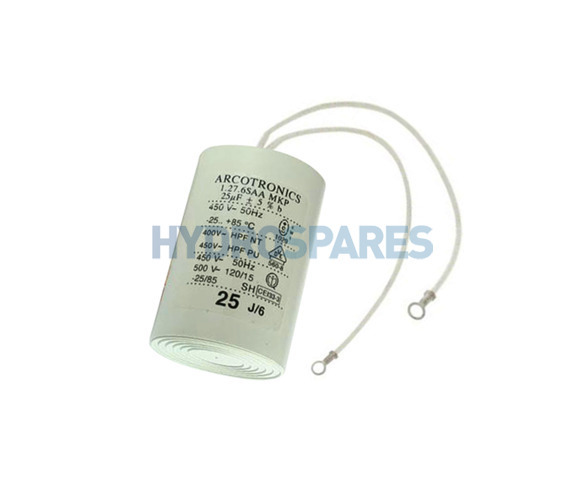 These will also replace many other capacitors fitted to many other manufactures motors. If your in doubt which one you need you can always match the microfarad ratings donated by the µf symbol. Spot-on, as stated it fitted the EMG motor on my pool pump and had tag eyes on the ends of the leads. Most 20 uf capacitors are 70mm long which makes for a VERY tight fit on the EMG motor top box. This one is a few mm shorter and is an easy fit in a few minutes.......good price too! Working spa bath again...Thanks to this and Chris' help at Hydro Spares. Hi Stuart, many thanks for you review. We are very happy your spa bath is working again!